This Simple, Effective Product Cuts Heat Loss And Promotes More Complete Combustion Of Wood Gases. 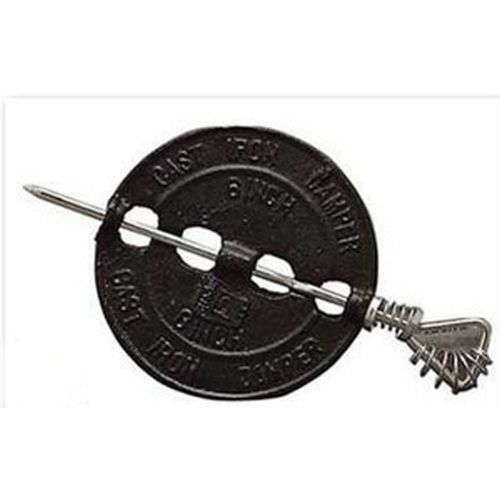 By adjusting this sturdy cast iron flue damper manually, the user maintains greater control of burn. Damper also retards the exit of escaping hot gases, promotes more complete combustion, and reduces heat loss up the chimney. A must for non-airtight stoves, we also suggest recommending the Cast Iron Damper for airtight wood and coal stoves for greater heating efficiency. While some stove retailers and manufacturers of airtights have been reluctant to recommend dampers, some preliminary testing by wood heating expert Jay Shelton, plus a good deal of customer input, has helped us make this recommendation. However, caution should be exercised when used in conjunction with stove draft controls. At low burn rates, the damper should be reasonably well open–as burn rate increases the damper should be closed more. NOTE: In situations where draft is especially good, two dampers mounted in series will improve burn control and fuel efficiency.